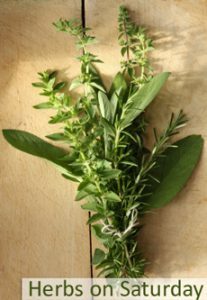 Home » Blog » Jerusalem & Being Ottolenghi Obsessed! Recently something has taken hold of me, I seem powerless to fight it, I find myself preoccupied with it, I am talking to everyone about it all the time, I have even dreamed about it at night! Oh yes, I am smitten, I am…..Yotam Ottolenghi obsessed! I have not felt this way about a chef or a cookbook for sometime. I was given ‘Jerusalem‘ by Yotam Ottelnghi & Sami Tamimi for Christmas by my Sister-in-law and it has captivated me ever since. Upon receiving it, I thumbed through it as I usually would, making a note of all the recipes that I wanted to try but I soon realised it was a rather silly exercise as I was bookmarking pretty much the entire book! There is something very grown up about this food. The use of spice in such an exciting way whilst many ingredients are humble and conventional is inspiring and surprising to my palate. The recipes come from the writers childhood memories of Jerusalem, which seems to be a melting pot for Jewish and Middle Eastern cuisine. I had no idea that their food could be so wondrous, I have been blown away. Anyway, back to the remarkable food! My aim with this post is to try to convey some of my passion about Jerusalem and to open peoples eyes to this wonderful cuisine and to Yotam Ottolenghi if he is unknown to you before now. Although I am an avid cookery book collector, I do not often cook more than a handful of recipes from any one book and even then, not in a short space of time. But things have been very different with this book. I have cooked 10 recipes and counting (all the more remarkable as this is week 12 of this year which means that I am almost cooking one a week!). I foolishly didn’t take photos of the majority of dishes but last weekend I did when I made Cod Cakes in Tomato Sauce. Unlike any other fishcakes I have ever had, they were amazing. The fish was chopped into little chunks which gave them a really meaty texture. Unusually spiced with lots of cumin and coriander, then simmered in a spicy tomato sauce. They were unforgettable and I look forward to making them for all my friends! Just stunning. But on to the recipe that I have chosen to share – Mejadra. I have chosen this particular dish as it’s a revelation. I mentioned before that the recipes are ‘grown up’ in this book and it strikes me that this one is particularly so. 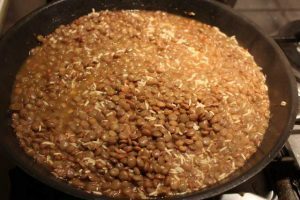 I would have overlooked this recipe in my youth but nowadays, I get excited by the idea of vegetarian food consisting of mainly lentils and rice! Mejadra is apparently a popular Arab dish and considered to be comfort food by both Yotam and Sami who both remember it from their youth. 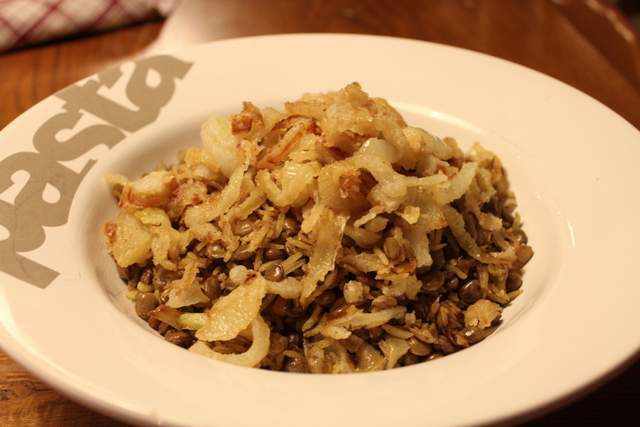 Who knew that lentils and rice, simply spiced with cumin, coriander, turmeric, cinnamon and all spice, punctuated with crispy deep fried onions, could taste this complex and flavoursome? It amazed me so much that I just had to write about it! So, if you fancy making a dish that is remarkable, striking, delectable and thrifty, then be bold and try this! It will not disappoint and you may find yourself enlightened as a result. Start by boiling your lentils in plenty of water for 12-15 minutes. Drain and set aside. 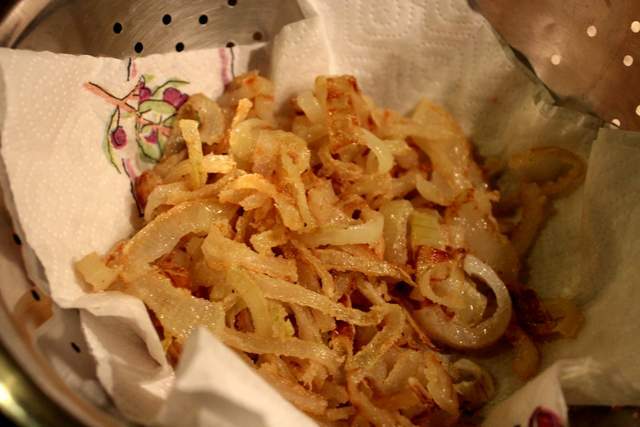 In a bowl, sprinkle your sliced onions with the plain flour and season with a teaspoon of salt. Mix them up to make sure they are all lightly coated. 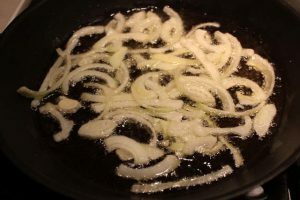 In a wide pan, heat up your sunflower oil ready to deep fry the onions. Once sizzling hot, fry a generous handful of the onions for 7 minutes until golden brown. Remove with a slotted spoon into a colander lined with kitchen towel. Season them lightly. Then fry another handful of onions and continue the process in batches until all the onions are nice and crunchy. Pour off any excess oil left in your pan once you have finished frying your onions and wipe the pan clean. Then gently heat your cumin & coriander seeds for a couple of minutes until they release their aroma. Be careful not to burn them. Then add the rice, olive oil, ground spices, sugar, 1/2 teaspoon of salt and some pepper. Stir to coat the rice and then add the lentils and water and bring to the boil. Cover and simmer on low for 15 minutes. Take it off the heat and take the lid off and cover with a clean towel and replace the lid to seal. Leave alone for 10 more minutes. Lastly, add half the onions to the rice and lentils and mix in. Serve in bowls topped with a dollop of yoghurt. Be prepared to be amazed! I am entering this recipe into few blogging chllenges. 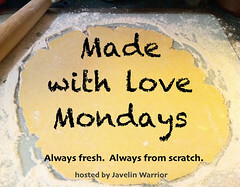 Firstly, Javelin Warriors Made with Love Mondays as it is made from scratch, no shortcuts at all! I am also entering it into Credit Crunch Munch as a dish made up of lentils and rice is pretty thrifty in my opinion! Co-hosted by Helen from Fuss Free Flavours and Camilla from Fab Food 4 All. And last but not least I am entering it into Karen from Lavender & Lovage‘s Herbs on Saturday, this month hosted by London Busy Body as this dish is just full of lovely spices! 32 Comments on "Jerusalem & Being Ottolenghi Obsessed!" When I saw Jerusalem, I really wanted to buy the book but never did. But now I’m wishing I had after your review here and how passionate you are about the book! The fish cakes look amazing and the mejadra sounds tasty as well… Thanks so much for sharing, Anneli! You ill not regret buying the book, I guarantee it. The recipes are just wonderful! Ha! Well done for declaring your love of Yotam publicly! This recipe looks so simple and yet so complex – what a great variety of textures and spices. I can’t wait to try it! P.S. I know what I’d like for Christmas 2014… Jerusalem…. please?!! This looks delicious! Thank you for entering Herbs on Saturday this month. I have Plenty but not Jerusalem so I know he makes lovely recipes. Thank you for giving me another variation of mujaddara to try. I love its simplicity. Simple but so complex…thats it’s beauty. I must get my hands on ‘Plenty’ as well. It sounds as though it is equally brilliant. Thanks for stopping by. Well, my mind is also on this book, Jerusalem. So far I have only heard positive comments about it and all I heard makes me more and more wanting it to be added to my cookbook collection. I’m still working on it. So glad to find another Ottolenghi fanatic! I, too am obsessed and probably have cooked more recipes already from ‘Jerusalem’ than I have from any of my great collection of cookbooks. The photos make you want to eat off the page – and as for the TV program – I wanted to jump into the screen and taste the food with him! I have cooked the cod cakes for the second time, last night, with barramundi (a prized fish in Australia) to serve for a dinner party tonight, as it was, as noted, even more delicious the second day. So nice to meet you fellow Ottolenghi Obsessed lady My friend just leant me Ottolenghi – Ottolenghi which is equally inspiring and she may not be getting it back! Thanks for stopping by. It’s a great book. The man is a genius! Love this dish too. I agree with you about all things Ottolenghi, fabulous! I can’t go a week without the beetroot salad from his first book. Your cod cakes look pretty impressive too! Thank you very much Anna. You have some really lovely recipes on your blog by the way. Thanks for stopping by here to I get the chance to discover you back! I just ordered ”Jerusalem” after reading this, thank you! I love his book ”Plenty”. As you say – SO many great recipes. Excellent! I have no doubt that you will love this one too. Be prepared to want to make just about everything in the book! I did not realize you were such a fan of Yotam and Sami! (who isn’t???). 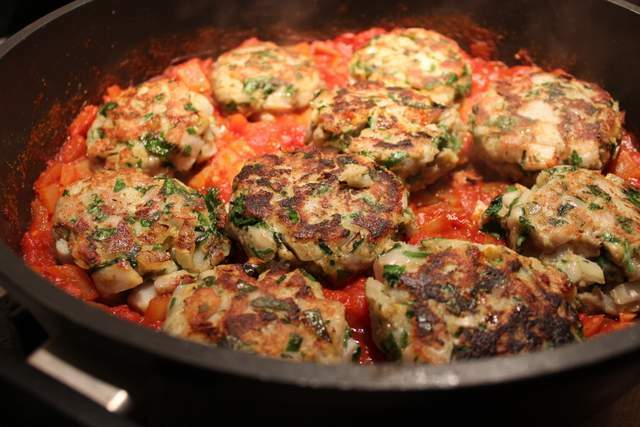 I am making the cod cakes in tomato sauce tonight! I am from Cyprus and love Otalenghi,s cooking. I grew up eating Mejadra, in Cyprus we eat it with olives and raw onions or yogurt . Try it with black olives it goes really well. I got both of the books and love the way in which he uses Nigela seeds with savoury dishes.we only use them for Cypriot pastry.I grow my own Nigela seeds in England. I am sure they grow better in France,common name for them is ‘love in a mist’ .” Try growing them they are lovely as an ornamental plants. I made this last night, and mine looked more like yours… which is to say nothing like the picture in the book. Flavors were amazing but his description of how to fry the onion was seriously lacking. It took forever and they weren’t crispy. Also no measurement on the water for the lentils led to problems.